I listened to Kay’s River of Stars as an audiobook on my trip to World Fantasy in Washington D.C. With a 20 plus hour drive ahead of me, I needed a super-sized serving of literature to fill the time. 656 pages and a Chinese dynasty fit the bill. Audio isn’t necessarily the best way to review a book. I’ve had many times where a narrator has either ruined an experience or even improved otherwise lackluster prose with an amazing performance. For Kay’s polished work, the narrator was top-notch, so you’d think there wouldn’t have been any distractions. However, there was one thing. Simon Vance is clean, precise, and has a wonderful tone. He is however, unapologetically, unequivocally, British. Rough and tumble soldiers and bandits of the Song Dynasty became cockney laborers. Venerable Prime Ministers sounded more at home in the House of Lords than Emperor Wenzong’s palace. With all due respect to Vance’s incredible talent – please, trad pub decision makers, stop casting audiobooks like Hollywood movies. From one white dude to a bunch of other white dudes, diversity ain’t a bad thing. Okay, got that off my chest – onto the story. I came into this not knowing Kay or the Song dynasty and the legends which this book borrows so heavily from. The picture Kay paints of his version of that world is so detailed as to be indistinguishable from any real world counterpart. The subtleties were ones even a learned expert in the field could appreciate (his go-to Historical China expert Professor Anna Shields, testified to that in a panel at the convention). In that, the book is a triumph of historical fantasy. Kay also does a masterful job of weaving a large cast of characters into this complex historical backdrop. He drifts nearly seamlessly between an omniscient narrator into tighter points of view. I say “nearly” because while I listened, I did find myself a few times wanting to skip the more detached history lessons and return to the characters. The information felt too repetitious or even too “prologue-esque” which gave those sections a feel as if they had been written as a serial installment and not a single novel. In the end I couldn’t pinpoint exactly where those sections didn’t add to the overall story (this might have come from listening and not reading). I will say if you hate prologues or slept through history class, this book isn’t for you. Even with all the solid grounding, there is enough legend and a taste of magic which sets the book apart from an academic exercise. Spirits and demons and emissaries of the Other are not a common occurrence, which adds to their mythic feel. When these encounters do happen, they are described in such a way as to be unreliable but also retain their vividness which I found refreshing. The one place the story does definitely stumble is with the characters. As a story about how reality crosses into legend, I’d like to have seen a more human, vulnerable side to these characters. They seemed to mostly fill the archetypal roles they were born to. The more interesting characters, for me, became the ones on the fringes. And maybe that was the intent? My biggest beef here was the inexplicable character transplant of Lin Shan which happened midway into the book. She begins as a fascinating, perceptive character who is bold on the page and stands out in the patriarchal society around her. But once she finds her true love, she slips maddeningly into stereotype. Her perception is blinded. Instead of deducing and acting she passively waits for answers and begs for explanations. One scene late in the book attempts to redeem her but falls flat. Which brings me back to the white dude plea above…ahem. 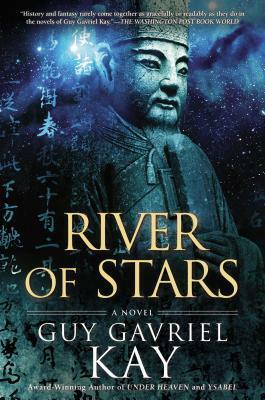 Regardless, River of Stars was the perfect companion for my drive and I was drawn into the world Kay so carefully crafted. Overall, I prefer a tighter focus on characters than a plot-driven, world building focus but I enjoyed my time in Kay’s Kitai and feel it is worth a read for fantasy and historical fiction lovers alike. Though, maybe a bit more for those history types.